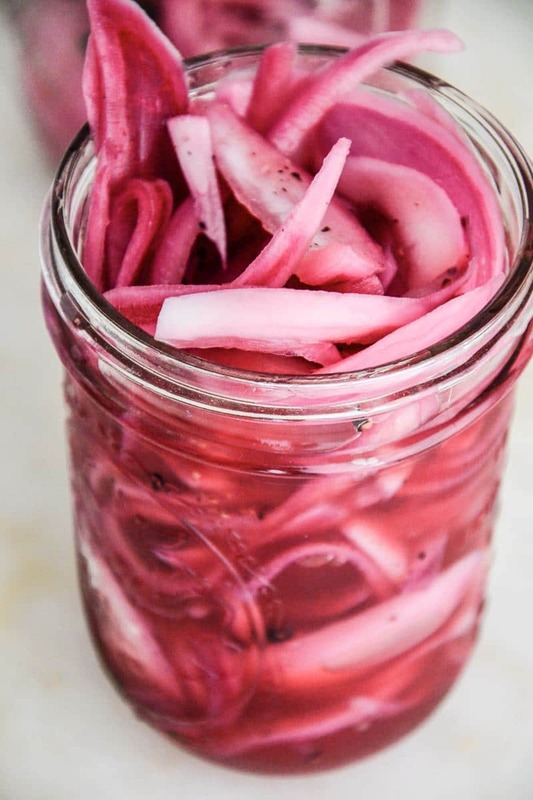 These pickled red onions are so easy to make (only five ingredients!) and will jazz up any dish as a flavorful topping from tacos to salads. They are sweet and sour and beautifully pink so they’re sure to brighten up any dish. There’s something about pickled onions that makes us smile. Maybe it’s their vibrant fuschia color or the fact that they add so much flavor to everything (and we mean EVERYTHING) that we serve these with. We don’t know about you but the idea of adding these pretty onions on fajitas and tacos makes us pretty happy. We’re condiment people over here so anytime we have an idea to create a new condiment, we’re on it and these are just the thing you need in your fridge to up the flavor profile of literally everything you eat. PREP TIPS // When you’re food shopping, try to buy organic ingredients. Here are The Benefits of Eating Organic. 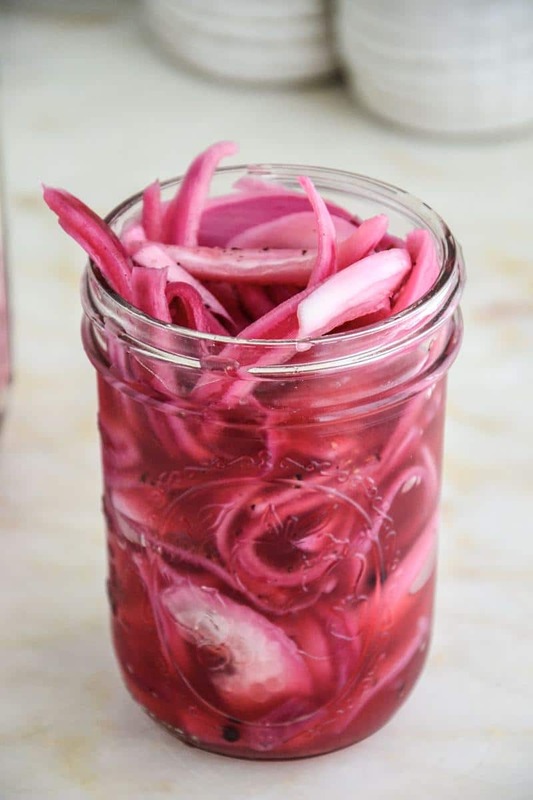 These pickled onions are ideal to make ahead to use throughout the next few weeks. You’ll need to let them sit for a few hours on the countertop before eating them so be sure to plan ahead. They are worth the wait. Trust us! We usually prep pickled onions on a Sunday night so that they can sit throughout the week in our fridge and be used that week and the following in all of our main meals. Find a schedule that works for you because planning ahead is well worth it when you have these in your fridge to add to everything. INGREDIENT SWAPS // You can easily use white onions but trust us, they do not taste as good so we recommend sticking with the red onions for this recipe. 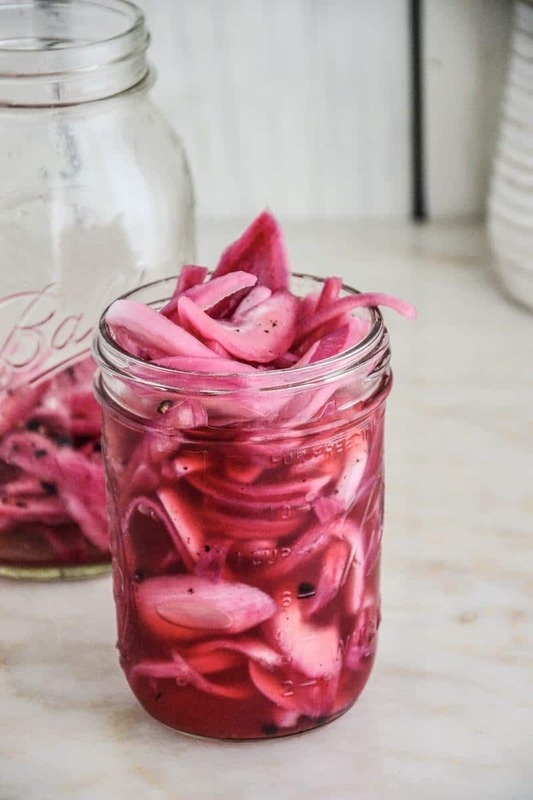 Here’s how we made these Pickled Onions in three simple steps. STEP 1 // Combine the apple cider vinegar, honey, sea salt and peppercorns in a small saucepan and bring to a boil. Pour over a bowl of thinly sliced red onions and let this sit on the countertop at room temperature for 4 hours. STEP 2 // Transfer the onions and cider mixture to a sealed ball jar and store in the fridge until ready to serve. STEP 3 // Serve chilled. Listen below for Amie’s tips that are not mentioned in this article as well as quick directions on how to make this recipe step-by-step. SERVING SUGGESTIONS // We love serving these pickled onions with our Roasted Carrot Vegetarian Tacos, Nourishing Roasted Cauliflower Bowl and our Easy Veggie Nachos with Garlic Tahini Sauce recipes because they pair well with anything from burgers to leftover sandwiches. We serve these onions straight out of the glass jars (as shown above in SHOP the RECIPE and place them on the dinner table for everyone to serve themselves. We highly suggest keeping the onions chilled until ready to serve so they are nice and crisp and cool to bite into as a topping or garnish. Our favorite way to serve these onions is with a handful of finely chopped parsley on tacos! STILL HUNGRY? 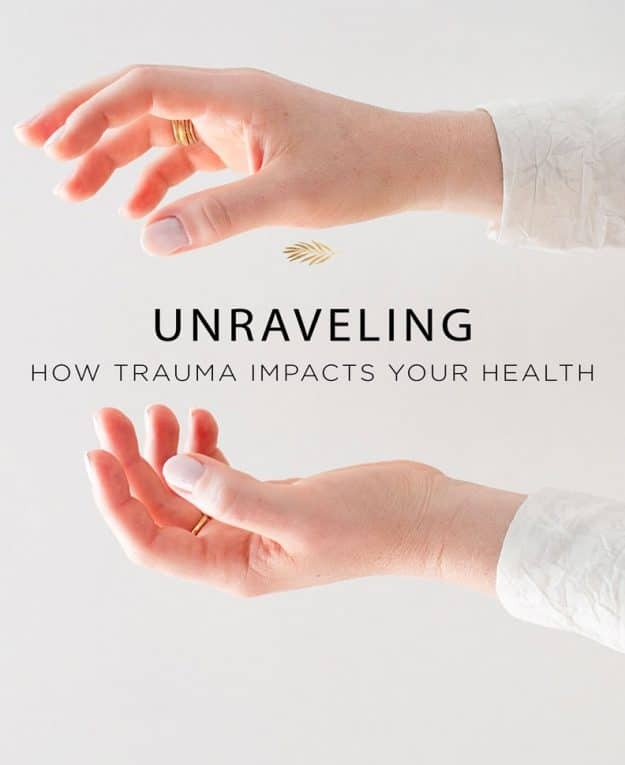 For more of our anti-inflammatory recipes, check out our 3-Month Anti-Inflammatory Program, which is only available for a limited time through April. 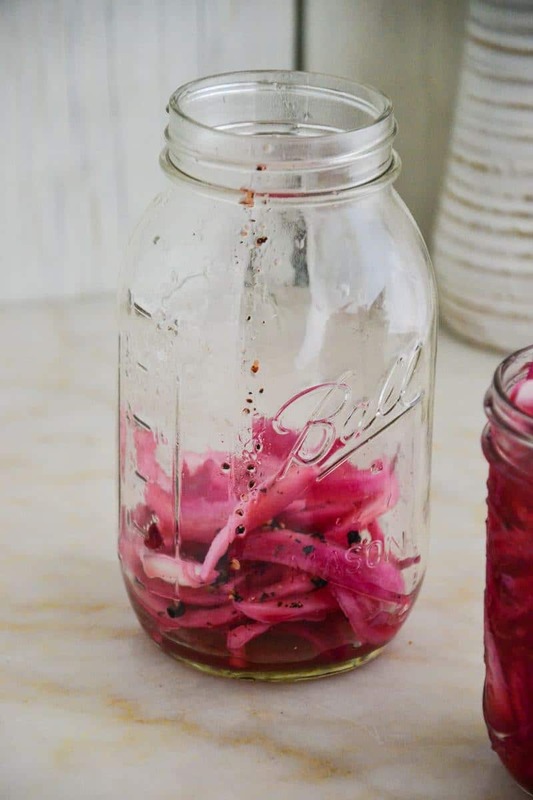 These pickled onions are so easy to make (just five ingredients!) and will jazz up any dish as a topping. Place the onions in a small bowl and set aside. Then, combine the apple cider vinegar, salt, honey and peppercorns in a small saucepan and bring to a boil. Remove from the heat and pour the liquid over the onions; let sit for 4 hours on the countertop at room temperature. Transfer to a covered container and refrigerate. This recipe will keep in the fridge in the sealed jar for up to 2 weeks.